Family holidays create fun memories for kids and adults alike and some stories that, at the time, might not be so much fun but turn into hilarious tales as time marches on. But the holidays are also a lot of work for the parents mostly. So we decided to offer up a list of 10 hacks we’ve seen used that could make your holiday easier and perhaps even more enjoyable! At night, it’s nice to have some light in the tent, but more often than not, the store-bought lights are really bright. Here’s a camping hack to help you set the mood for your holiday. Plus, it’s super handy if you forgot the lanterns or didn’t bring extra batteries. Take an empty milk or water jug, then strap your headlamp around it. This will easily light up your whole tent for the evening. This is one of those perfect camping hacks to get you through an evening if you just need to buy more batteries the next day or to use throughout a holiday instead of a traditional lantern. Eggs are such a versatile food and so easy and a camping food staple. However, transporting the eggs from home or even from the supermarket after you get to the camping area can be tricky. You’ll often find your carton is wet because the eggs cracked in transit. So, instead, you’ll save not only time but money by cracking and putting the number of eggs you need in plastic water bottles and keeping in your cooler. 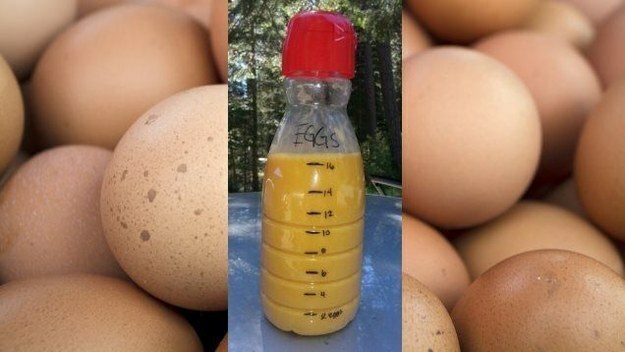 For each half litre bottle, you should be able to get eight to nine eggs in it. This is probably an obvious camping hack, but you’ll want to be sure to pack right outdoor gear, even if there’s only a slight chance of rain during your stay. Plan to bring an extra tarp as well as plastic and ziplock bags and outdoor clothing, which includes hooded rain jackets. It’s better to be prepared and glad because you didn’t need it, then spending money on unnecessary gear and being wet and miserable. The number one tip to come out of this hack should be to triple-check your tent for waterproofing. Make sure you have the rain fly before you leave for your holiday. It’s a good idea to set up your tent at home before you leave and test out the waterproofing by spraying it with a garden hose. Beside being a useful tool for finding your way to the facilities in the middle of the night or lighting the way back you campsite, the flashlights could help entertain the kids in the evening. Flashlight hide ‘n’ seek begins by picking to be “it,” and then that person carries the flashlight. Next, the “it” person should count to at least 30, best to give your participants to 50, so the rest of the children have time to hide. After counting, the person who is “it” uses the flashlight to locate people and shines the light on them to signal they are out. 2) Once someone is found then that person is now “it” and needs to count, etc. Don’t forget to set limits on how far each direction the children can wander—you don’t want to find yet another use for that flashlight! If you brought the whole family camping, then there will certainly be evenings of hanging out the campsite. And invariably you’ll get nagged about having dessert at least a couple of time. Here’s where this particular camping hack doesn’t create a bunch of work for parents, and it will thrill the kids. Let the kids join in to make this easy camping recipe! The directions are literally this: Slice a banana nearly in half lengthwise. Stuff it full of chocolate and marshmallows, wrap it in tinfoil and place it on the grill until hot and gooey. That’s it! Recipe from: TwinDragonFlyDesigns. It probably seems odd to drag along your coffee maker to the campsite, especially when there’s so much to pack anyway. But if you need that morning cup of java, what’s a coffee addict to do? Sure, checking out local coffee spots would be fun for one or two mornings, but sipping that first cup at the campsite before heading out or enjoying one after dinner isn’t a bad idea. Plus, who wants to buy for every coffee over your holiday? Here’s where this camping hack is genius. Place coffee grounds into a filter, and then close it using dental floss. Put it in hot water like a tea bag and just allow it to steep as you would with tea. And in a few minutes, you’ll have your cup of coffee! How cool would it be to simply cook up dinner through the use of the sun? This camping hack gives you an oven no matter where your camping holiday takes you — on site, the a picnic table on a hike or even the beach. The Sunflair solar oven, which weighs less than 1 kg, is about the same size as a seat cushion when it is folded down, according to the company website. If you purchase the deluxe kit, you’ll also get two silicone pots, which both provide a place to cook foods at a temperature of up to about 282º C. The oven’s temperatures are dependent on where you are and the season, but according to the site, it works for “four seasons below 40′ degrees latitude and three-season above. A UV index of 4+ is best for solar cooking.” The Sunflair costs anywhere from $89 to $164. Use this camping hack to improve your holiday photos! Most of us use our smartphone to take almost every photo or video these days. Quite a few of those smartphones are iPhones. Well, our tip involves utilizing the grid feature when you are in the camera mode. It helps you properly set up your picture, giving you the chance to follow the photography rule of thirds. This explains the rule more fully, but the short explanation is that each photo should break down into thirds both vertically and horizontally, which leads to having nine parts. Line up the photo subjects along those intersections, leading to more photos that are pleasing to the eye, rather than the subject ending up direct in the centre! Camping and mosquito bites go together like bees and honey, but what’s the best way to treat them after the bites happen? It seems like everyone has some “secret method” to fixing the itch from using a lemon slice or oil of oregano to creating an X across it using your nail. But, trust us, this camping hack provides a solution for the itching and uses something you’ll already have on hand. Not only will deodorant keep you smelling fresh during your camping holiday, but if you rub it on a mosquito bite then the itching should subside? Bet that’s one “secret trick” you’ve never heard of! Our holiday park is the perfect place to test out all your camping hacks—the ones listed above and any other you might discover! We have excellent facilities, affordable accommodation and proximity to the beach, what else could you want on a camping holiday? Bring the whole family, research more hacks (because making your life easier is always a plus, especially on holidays) and plan to set up a comfortable home away from home at Broken Head Holiday Park. Contact us to book your stay for the summer holidays!